The Newsteo Tracker is a shock recorder that can measure and record for 2 years the conditions of carriage of goods. It includes the recording of temperature, humidity, light and shocks (on 3 axis) as well as free fall height. It also indicates the duration of the shock and its energy. All actions are time stamped so you know when an abnormal event has occurred. Having configured and activated the Newsteo Tracker, just fix it in the container, truck, box… before it leaves. The Newsteo Tracker continuously measures various parameters and stores corresponding measures. Upon arrival, the measures are wirelessly downloaded on PC, through the package of the good. Who uses the Newsteo shock recorder ? 129 000 measurements blocks, one shock using 2 blocks (corresponding to 1 record campaign of 2 years, with one temperature measure every 15 minutes and 29000 shocks). The TRE is delivered with 1 x Thionyl Lithium Battery, type A, with connector. The TRE also includes a battery holder, in which a 1.5V alkaline battery type AA / LR6 can be put. The use of this battery will not reduce the product’s performances, but only the autonomy (1 year then) and the operating temperature (-10°C to + 50°C). 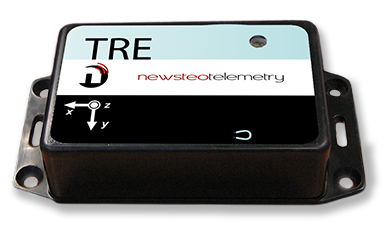 This kit enables you to estimate the Newsteo Tracker TRE 35. A CD-ROM containing the installation of the RF Monitor software with USB drivers, the application software of the Tracker which enables the restoration of the recorded measures, and the documentation. Price of the kit: 500 EUR excl. VAT, preparation and shipping costs in addition.